Our lovely mini-Jersey/Zebu cow, Arya, and her male counterpart, Gendry, recently had a calf - Nymeria. (I don't have a Game of Thrones obsession - just a general fantasy novel obsession.) Arya had been giving us about half a gallon to a gallon of milk a day, plus whatever Nymeria drank. Then she got mastitis. While she was sick, we ran low on milk and I had to go to the grocery and buy regular milk. :( Happily, she's all better now, but that store-bought milk is staring at me evilly. We didn't need the store milk to drink, we had pre-mastitis milk for that. I needed pasteurized milk to keep my yogurt going. Captain Flint (my Filmjolk yogurt culture) needs to make a new batch of yogurt at least every seven days to maintain his fierce vitality. Filmjolk is an heirloom yogurt culture - meaning it won't die out after a few generations. When I was little, Mom made yogurt with milk, store-bought yogurt and a yogurt maker. Every batch of yogurt made, you had to inoculate the milk with the store-bought yogurt. No matter how hard you tried, you couldn't keep it going by inoculating it with yogurt you made in a previous batch. Eventually, the culture would die out and nothing would happen. With heirloom cultures like Filmjolk or Villi, it's much simpler. Make a batch of yogurt and eat it. Save a bit, and then make some more. Each generation is made from the leftovers of the previous batch, no need to keep buying an outside culture. Captain Flint is also a mesophilic culture, meaning that I can culture him at 70-77* on the counter - no crock pots, yogurt makers or pilot lights in the oven required for heat. I put him by the coffee pot, since there's a tank on it that keeps water hot, and he stays a few degrees above room temperature. The other type of yogurt culture is thermophilic, and it cultures at 110*. It will give you a bit thicker final product, but I like the ease of use I get with mesophilic cultures. Toss it in a jar, let it sit and refrigerate. It's idiot-proof (perfect for me) as long as you make it at least every seven days. I've had Captain Flint since December 2016, and he's only made pasteurized milk yogurt. Before him, I kept a batch of pasteurized Villi yogurt going from August 2013 until late in 2015 when my life got stupid-crazy-out-of-control. Given the choice between the two, I like my Filmjolk better than the Villi. Captain Flint takes abuse and comes out fighting. Every time I forgot to make my Villi at the right times, it got ropey and funky for a generation or two, and I had to nurse it back to health. Too much headache, I'll take the Filmjolk. and it has a little home by the back of the coffee maker. Making pasteurized heirloom mesophilic yogurt (boy, that's a mouthful) really is that simple. You'll need 2 tablespoons of yogurt for every pint of milk you want to culture. (I usually make it one quart at a time.) 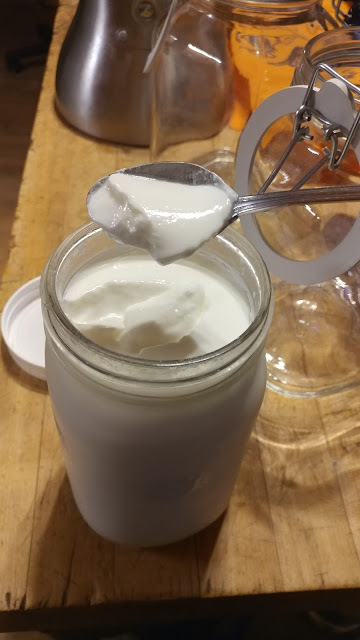 Put the yogurt in a canning jar and fill with milk up to the threads. Screw on a lid and shake it up. Remove the lid, and cover loosely with a towel. Keep at 70-77* for 12-18 hours. 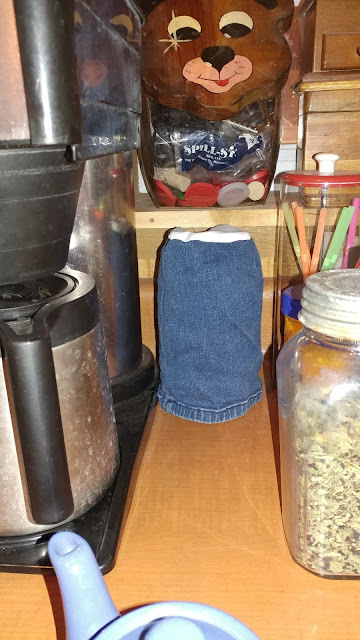 Sometimes it gets too cold overnight, even if I keep it near the coffee pot - but that's okay. Just leave it on the counter for a few extra hours, and it'll thicken right up. After you refrigerate it, it'll thicken a bit more. 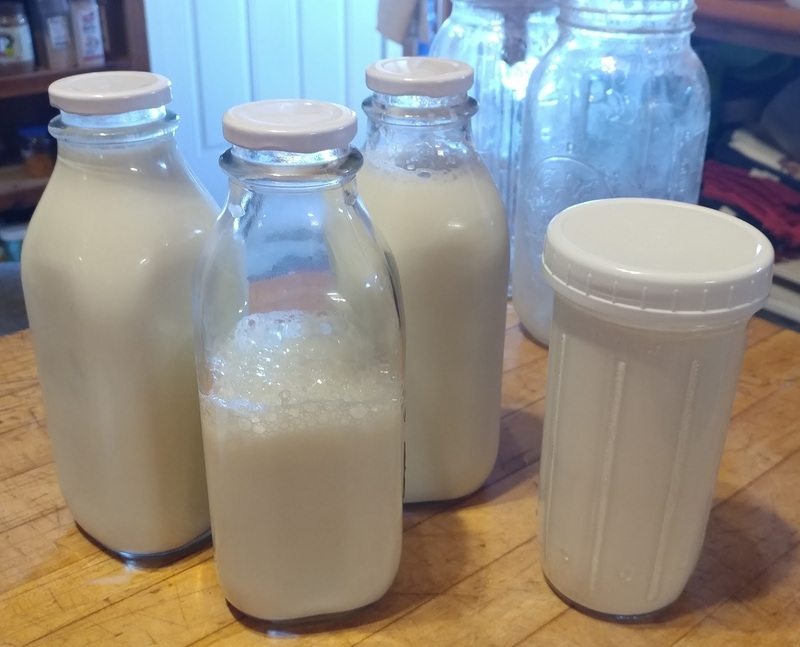 The raw milk counterpart to that takes a bit more work, but really isn't any harder. You need to keep a mother culture made with pasteurized milk going to inoculate each batch of raw milk. Raw milk will culture all on its own if given the chance, though you may not like what you come out with. Keeping the mother culture with pasteurized milk will keep your yogurt from getting funky. Culture 1 tablespoon of yogurt in a half pint jar of pasteurized milk. Use that as your starter, and remake it every 7 days. From that starter, use 1/4 cup to culture a quart of raw milk. Depending how much yogurt you eat a week, you may need to keep a pint or more of the starter going, instead of just the half pint. To pasteurize your raw milk for the starter, slowly heat it to 160* and then let it cool back to 70-77* before you add the culture. Some people (your friendly federal government most prominent among them) have issues with raw milk. There is the possibility of bad bacteria getting into just about anything that you eat or drink, but I'm content with using good food safety practices and not being stupid about raw food. If you care to read what Big Brother has to say on the subject, go here. It reads like the intro to an episode of Elvira Midnight Madness, though...Hello darling, and welcome to Big Brother - it's me again, Elvira, the government hair with the authoritarian flair! Tonight we're going to delve deep into the daunting darkness of RAW MILK!!! (Insert dramatic music from 1940's horror flick here.) I suggest reading it and making your own decision. This yogurt will be thinner than what you're used to getting from a container of Dannon or Yoplait, and if you're into Greek yogurt, don't get me started. There are ways you can thicken your yogurt, from straining it to adding powdered milk or other thickeners. Not all thickening methods work with all types of yogurt. I've never tried thickening my yogurt, so I can't recommend one over the other. This page at Cultures For Health has plenty to get started with, though. Throw it in the fridge for about 6 hours, it'll thicken up, and you're ready to go! Aside from just eating your yogurt with fruit or jam, there are a multitude of fun things to do with it. You can use it to make cultured butter and buttermilk, or cultured cheeses (like Creole cream cheese, farmer's cheese and cottage cheese). It can also be used in recipes calling for yogurt or buttermilk, and it's great in smoothies. Below is a great Thousand Island salad dressing recipe you should try out. Get cultured! Whisk all ingredients together, and refrigerate. Cultures For Health - This site is a wealth of knowledge. When it prompts you to enter your email address and get the free e-books, I strongly suggest you do so. Those books are worth the read. There are great recipes, but these guys explain the THEORY behind almost every cultured food you could want to learn about. Give it a read, you won't be sorry. but he helps out with spreading pumpkin, too. Pumpkins (and other winter squash) store well – this is one of the many awesome things about them. However, they’re not exactly the most convenient thing to deal with in the world. Before you can make delicious pies or breads, you have to bake and puree the darn thing. Most have a fairly long shelf life, but if you don’t store your winter squash in the right conditions, they can spoil rather quickly. One of the easiest ways to get around this is to dehydrate and powder your pumpkins and winter squash, leaving you with a space-saving convenience food. While pumpkin may be canned, there's a few reasons I stick to dried. First and foremost, there is the issue of wetness. Boiling versus baking versus roasting versus Libby's will all yield different amounts of water in your puree. Cushaw versus Cinderella versus Sugar Pie - each pumpkin variety will be different. 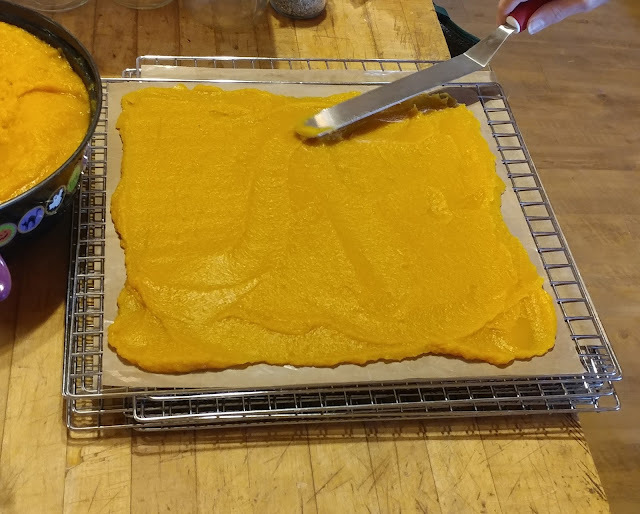 When you dehydrate and powder, they all become equal, allowing you to choose the moisture level upon rehydrating.Secondly, pumpkin will dry down to one quarter of the size it is when wet. For some people, that may not be a big deal. As I tend to fill up shelves with all kinds of other canned things, storing five quarts of dried pumpkin is way easier than about twenty quarts (or more) of canned pumpkin cubes. Coincidentally, that leads me to my third and final point - pumpkin cubes. Sadly, Big Brother tells us that we cannot can pumpkin puree, but oddly enough, neglects to mention why. This post on Living Homegrown goes into the reasons why you don't want to can puree - mainly, pH and viscosity. Since I find dried pumpkin easier to deal with in the long run anyway, I'm ceding this round to him. This year, our pumpkins and other winter squash lived in the shower in the laundry room (don’t worry, we used the other shower instead). It was the best place we had to store them – cool room, no direct sunlight, and they weren’t likely to get kicked by accident. Eventually, though, they were coming to the use-it-or-lose-it point, so Mom and I cut them up, gutted them, tossed them skin-up on some half-sheet pans and threw them in the wood stove for a few hours. There’s a few ways to cook pumpkin. When my wood stove is hot, I’ll use the oven there. Since the wood stove oven doesn't vent out the steam like a normal oven, I don't bother adding water to the pan. If I'm not burning a fire, I use the regular oven on 250* and pour some water on the bottom of the pan. I’ve seen some people who cut the meat off the skin and boil it. No matter what path you choose, cook the squash until it’s fork tender. Let it cool a bit, and remove it from the skin. Once it’s off the skin, start pureeing the pumpkin. I like to do this in my food processor, but you could use a blender or food mill, if that’s what you have. (The smoother it is now, the easier it will powder and rehydrate later.) Spread the puree out about 1/4" thick on your fruit leather dehydrator trays – an offset spatula for cake frosting is really helpful here. My refurbished LEM dehydrator didn’t come with fruit leather sheets, so years ago, I ordered these that were made for Excalibur dehydrators, and they work like a charm for me. In the event that you don’t have/want to buy fruit leather sheets, you can use a gallon freezer bag split down the seams to make 2 sheets. It’s thicker than plastic wrap, and therefore less likely to tear and leave pieces of plastic in your pumpkin. I’ve also seen people who use parchment paper, but I’ve had bad luck using it in dehydrators. If it goes too long in there, sometimes the parchment paper will shatter into your food when you’re removing it. 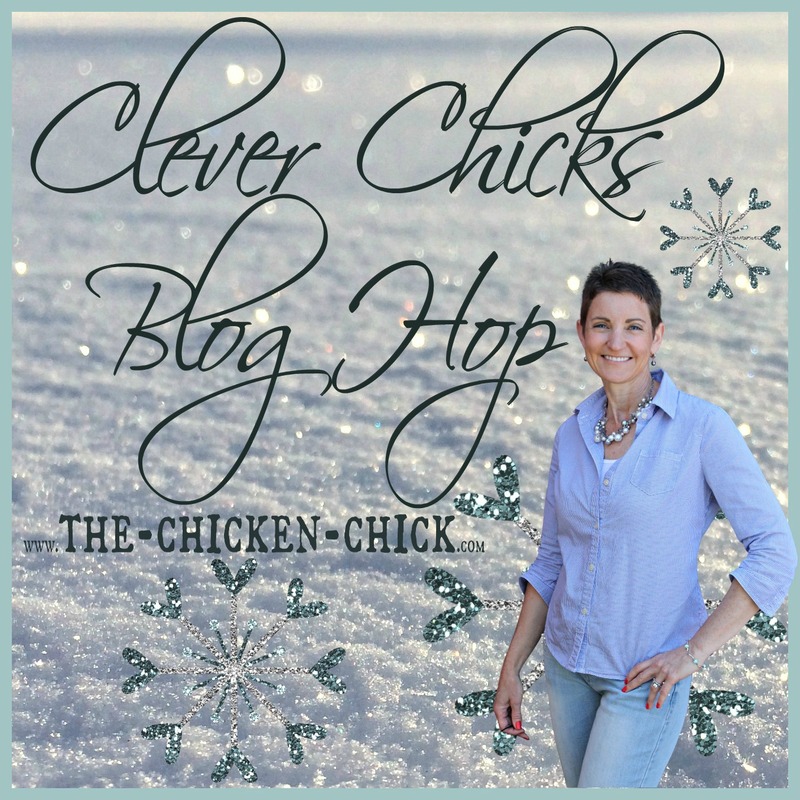 The reason I don't worry about precise temperatures on dehydrating food is simple. 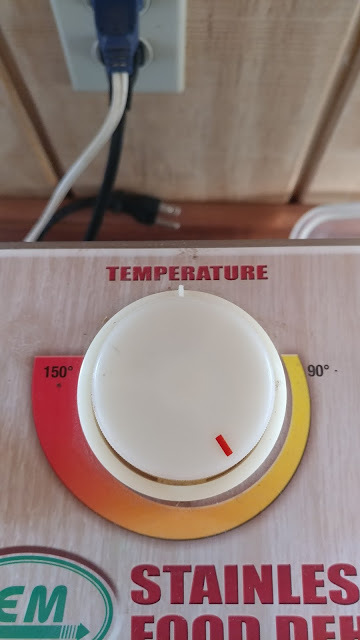 On my dehydrator, there are exactly two precise temperatures - 90* and 150*. If I need something in between those two temps, I take a guess and it tends to work out well. After you've got your sheets in the dehydrator, crank the heat to about 130-140* and let 'er rip. Here in super-dry Oklahoma, pumpkin will dry in about 8-12 hours. In Louisiana, where humidity is a way of life, I had batches that took 18 hours, and some that took all the way up to 48 hours. 8-12 hours is a good place to start, but if you've got high humidity, don't be surprised when it takes longer. In the past, I've used a variety of methods to powder dried pumpkin. Up until I killed my little Bullet blender, that thing was great for getting it down to a fine powder. How did I kill it? By grinding too many pumpkins in it, probably. Note that I have 5 quarts of ground pumpkin on my shelf, pumpkin dries down to about a quarter of the original size - I have run a LOT of pumpkin through there. It's not like this baby died overnight from gentle, loving use - it got abused regularly. But if you're more reasonable than me, and don't have THAT much pumpkin THAT often, blenders, food processors and even a mortar and pestle are good options. My current go-to solution for grinding pumpkin is our Grainmaker grain mill. That thing is a beast. So far I've used it on corn and pumpkin, and it works fabulously. You can adjust the fineness of the powder that comes out. Again, the finer the pumpkin powder, the easier it will rehydrate. Moving on - rehydrating pumpkin (or winter squash in general) is simple. Take 1/4 cup of powdered pumpkin and a scant 1 cup of boiling water. Mix and let sit until desired consistency is reached (should take maybe fiver minutes). This is where the texture of your powder really comes into play. If you've got a texture like corn flour, your pumpkin should come back to the original texture fairly quickly with no lumps. If it's more the texture of dried grits, you're probably going to have to help it along a bit. Just encourage it a bit with the blender (stick blenders work well here) and you'll have nice, thick pumpkin in no time. Then you're ready to bake deliciousness! You can see the color variations - there's at least 4 different types of pumpkins in 2017 alone, not too sure on the others. My 2015 has some larger pieces in the top, I either need to regrind him or just take the stick blender to him when I get ready to bake. So Easy to Preserve - 5th edition, by Cooperative Extension, the University of Georgia.